The Oxford Blanket from the Blanket Diva collection features a classic stripe look. Includes 1 FREE line of embroidery of up to 20 characters. 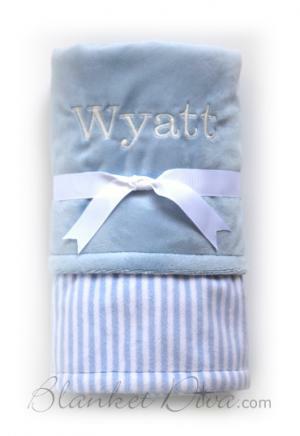 Personalize the blanket with an embroidered name, message, birth date, and more! Include a personal note for the note card included with this blanket. * Shipping cost will be calculated and added upon checkout. Country: We currently only ship to United States. Located elsewhere? Consider using an international mail forwarding service such as Bongo US.